Before Game 1 of the Calder Cup Finals, the Syracuse Crunch had lost just one game throughout the entire AHL postseason. Not only that, the Crunch hadn’t lost back-to-back games since April 9 and 12. Following Sunday night’s 6-4 loss to the Grand Rapids Griffins, however, the Crunch have now lost back-to-back games and face the threat of elimination with just two more losses. Their postseason record now stands at 11-3. Making matters worse, Syracuse dropped the first two games at home, often a death blow in the Calder Cup’s current 2-3-2 format for the Finals. The Crunch must win at least two games on the road against Grand Rapids to bring the series home for Game 6 and possibly Game 7. 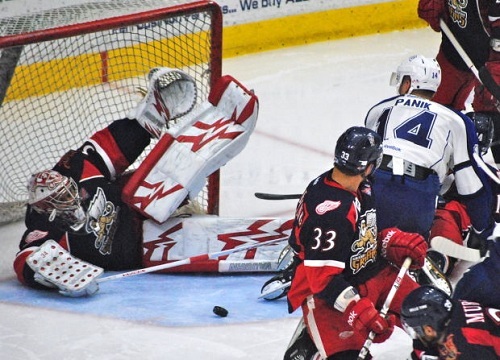 So far in the series, the Tampa Bay Lightning-affiliated Crunch have outshot the Griffins 63-49. However, goaltender Cedrick Desjardins has allowed nine goals in the first two games. Grand Rapids goaltender Petr Mrazek makes a save on Syracuse Crunch forward Richard Panik #14 on the way to a 2-0 Rapids lead in the Calder Cup Finals. Game 3 is Wednesday night at 7 p.m. The Crunch have battled adversity throughout the season, losing many players and even their coach, Jon Cooper, to the NHL level at various points throughout the year. However, once the playoffs begin, the team* kicked it up a notch, needing only 12 games to win the Eastern Conference. * The Crunch are still mostly comprised of the core group of players that won the Calder Cup with the Norfolk Admirals last season. The Lightning swapped their AHL affiliation to Syracuse in the offseason. Now, Syracuse seems to have hit a wall again. Although each game in the series could have gone either way, the Griffins came up with big goals in big moments. “There were times they were really carrying the play in our end,” Zettler said. “They controlled the puck. They were zipping it around pretty good. We need to do a much better job of eliminating people in our end and not allowing them to continue their forward movement and skate around. Game 3 is Wednesday night at 7 p.m. The Crunch will have a morning skate at 11:15 a.m. at Van Andel Arena in Grand Rapids, MI. I think it’s safe to say that Rob Zettler and the coaching staff consider this one a must-win. The game can be viewed on AHL Live for free with the promo code “Calder2013”.